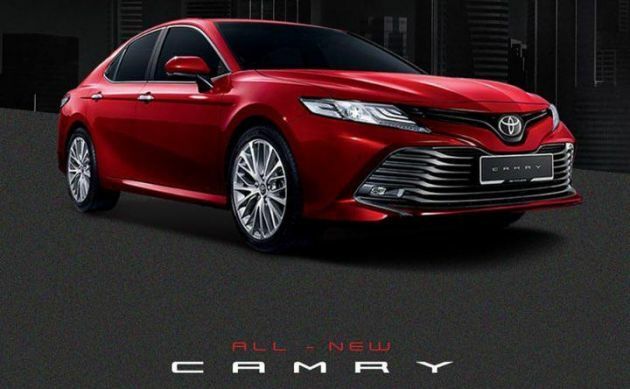 The new 2019 Toyota Camry will be heading to the Kuala Lumpur International Motor Show (KLIMS) next week, as revealed through a Toyota Malaysia Instagram post. Specifications and pricing have already been announced for the eighth-gen Camry, which will be sold here in a single 2.5V variant form at its point of introduction. To recap, the Camry is priced at RM189,900 on-the-road excluding insurance, although this is still classified as “estimated,” so the final figure may yet be revised. The Malaysian-spec XV70 – which sits on the automaker’s Toyota New Global Architecture (TNGA) platform – is equipped with the 2AR-FE 2.5 litre four-cylinder engine from the outgoing Camry, though it now has four PS more at 184 PS and 235 Nm. The six-speed auto has also been retained. Exterior kit includes automatic bi-LED projector headlamps and LED turn signals, daytime running lights, fog lamps and rear lights as well as 18-inch wheels (wrapped with 235/45 series rubbers), auto wipers and dual exhaust tips. Six colours are available for the car – Red Mica, Platinum White Pearl Mica, Silver Metallic, Graphite Metallic and Burning Black CS GF. The interior, meanwhile, is dressed with “smooth leather” upholstery and eight-way powered front seats as well as memory power adjustable steering, an eight-inch capacitive touchscreen display with navigation, a 10-inch colour head-up display (HUD) and a seven-inch colour multi-info display housed between two Optitron dials. The kit list also includes a nine-speaker JBL audio system, an electrochromic rear view mirror, keyless entry and push start, electronic parking brake (with auto brake hold), dual-zone auto air con with rear vents, wireless smartphone charger and a digital video recorder (dashcam). Safety equipment includes seven airbags, front/rear parking sensors, hill start assist, blind spot monitor with rear cross traffic alert and a raft of systems grouped under the Safety Sense suite, among them pre-collision system, lane departure alert with steering assist, dynamic radar cruise control and automatic high beam. Mazda 6 sales in the past was so low. I think few hundred since launch. Accord nobody buys because Perdana has tainted its prestige and name. Camry sales in the past was so low. I think few hundreds since launch for new Camry. Or either Camry also nobody buys because Camry has tainted its prestige and name. This Camry is the size of a Mercedes E-class and BMW 5-sereies yet sells for over 20 percent less than the much smaller Merc C-class and BM 3-series. It is not aimed, nor will it lose (or steal) buyers from those German luxury marques. The reason Mazda 6 sales was low was the rediculous price. Now this Camry is priced the same as the CBU 6 2.5. maybe this Camry will sell just as many as the Mazda 6. If you can’t tell the difference between the new turbo accord and the 2 generation older perdana, then you are in the wrong forum. Bro, this dude has ZERO automotive knowledge. Hes just here to please his political paymasters. Accord drivers are malu because proton rebadge their cars? Ahahaha how many perdanas are otr? Like 5 in total of Malaysia? Also it’s the outgoing model so who cares. Most non car ppl look at an accord and immediately think the owners are financially stable. Can’t say the same for a Camry. They’ve all looked exactly the same the past 10 years. Wow such a beauty. Wait till the 2.0 come out, then price will be reasonable RM150k. This will be a top seller. Now you know why Toyota bashers like john and Mario and Bros are hiding today. Malu. Don’t know where to hide their. This car so expensive also but already got hundreds or orders. Perdana so cheap at RM113k also but nobody wants to buy and got ZERO sales from public. Follow Toyota USA tagline: “If you wanna buy a good Toyota, go buy a Mazda”. Hopefully UMW is not pulling a CHR again where by the constantly tease but never launch. They are too shy to launch the X70. This is becaus eit is Li Chunrongs success and China’s success. Locals cannot tahan the malu. *2.0L turbo and 1.5L turbo. Provided the 2.0L Turbo makes it here, If Honda Malaysia drops the turbo halfway during shipping then we will have a 155hp 2.0l NA Honda Accord which will be a human-powered trishaw if you say the Camry is tricycle. I will be surprise if someone actually going to buy a Camry at that price. Umw probably won’t care since they are content in selling vios and avanza . It’s on par with the Mazda 6 so why not? WOw, after insurance and roadtax will hit above RM190k. Such obscene pricing for a Toyota. Tell that to Mazda too. Also wished if the all new Camry cud have my previous beige/ brown interior with nice wide comfort driver and pasengers seats.better headlights for drivers esp on dark highways as part of our NS peninsula highways are not well lighted. I see more plastic at the front grille…..
Goodbye Fugly Camry, Now we are waiting for the beautiful Accord. This is the old engine right? Too bad it’s not the new engine and transmission. First of all I’m not a Toyota fans, but this car is well designed and the most selling point is the new chassis, you can go Google more whats the chassis contribute to this car. And poor thing is, the old engines and drive train will be brought to Malaysia again, thanks to UMW and those people who buy may be don’t care, is up to the buyer anyway. Poor thing is UMW found the sales not good and they bring in new engine later and name it X or what… And then the loyalty Toyota fans will cry for low RV for their unit..
Ini saya setujui …MY Baru enjin baru. Australia camry oso use the same engine though. All I can say is… Looks better then before. Especially interior. But Honda Accord is coming soon. If you read and watch reviewer from US and other parts of the world. Honda engine perform better. Accord is using type R engine which have been detuned to adapt Accord styling. All I can say, even 3.5L V6 Camry vs 2.0 Turbo accord. Accord is winning. Let’s see how they perform in term of sales. Only figure will tell the winner. Is the Toyota after sales team equipped to handle this car?